If you are accustomed to using a manual corkscrew to open your favorite wine, chances are that sooner or later you may want to consider purchasing an electric wine bottle opener. Unlike a manual corkscrew, electric corkscrews can open a bottle of wine in seconds and require little to no hand strength, making them the ideal accessory for people who entertain frequently. Here, you’ll find the five best electric openers reviews from $19 to $39 worth buying. Why do people choose an electric wine opener? One important reason you might want to invest in an electric opener is that it can extract the cork from your wine bottle without shaking it. Shaking can stir up residue from the bottom of the bottle, causing an unpleasant taste. It can be difficult when you are using a manual opener to keep the bottle completely steady. Electric corkscrews allow you to place your bottle on a flat surface and remove the cork with less movement. A second reason that many people decide to purchase an electric wine bottle opener is that they require minimal hand strength to operate. If you suffer from a condition like arthritis that affects your strength and dexterity, an electric opener can be your new best friend. Most of them can be operated with just a touch of a button and only require one hand to open a bottle within a few seconds. The best wine openers have screws that are at least 1.75 inches long. This will ensure that the cork does not break. Make sure that the actual screw is a worm and not an auger. A worm looks like a coiled worm while an auger looks like a worm coiling around a nail. Augers tend to break the cork, leaving pieces of it floating around in your bottle. Be sure to use the foil cutter first to remove the outer wrapping which will help to keep your appliance in tip-top shape. 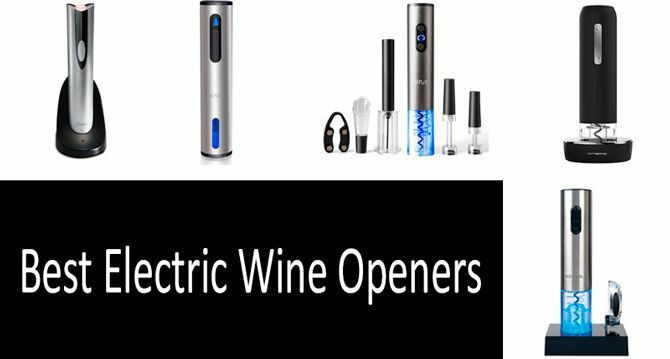 Next, we are going to look at five of the best electric wine openers on the market and compare their features and benefits. We've reviewed five different models which can open up to 45 bottles of wine on a single charge, from a simple one for $19 to a $39 electric opener with an air pump. The Secura wine bottle opener is an attractive and useful household appliance that’s perfect for entertaining. The opener has a stainless-steel handle that fits comfortably into the palm of your hand and can remove a cork from your favorite wine in seconds. The built-in rechargeable battery can open up to 30 bottles of wine on one charge, and a handy foil cutter fits right on the base of the opener, so you will never misplace it. There is a transparent shell that surrounds the corkscrew which allows you to see when the cork has been removed from the bottle. The charging base features an eye-catching LED light that makes this appliance at home on the countertop or bar area. Can you turn off the blue light? Yes. You can unplug it when it is not charging. How tall is this when it is sitting on the counter? It stands about 10.5 Inches while charging in the base. Will it work on large bottles of wine? Yes. Provided the cork is standard size, which most are. No. It is very quiet. It makes less noise than an electric can opener. Does it work on plastic and rubber corks? Yes. The opener can extract synthetic corks with no problem. Only for use within North America. The Oster cordless electric bottle opener can open up to 30 bottles of wine on one single charge, and its simple design allows you to remove a cork in seconds. The opener has a well-designed, soft-grip handle that fits comfortably in your hand and is simple to use. It can sit on the counter, a buffet or a bar without taking up much space. To fully recharge it, you should plan on six to eight hours after which point it should last for quite a while. An LED charging light on top and a power indicator light at the base will let you know once it has been fully charged. The opener comes in three stylish colors to match your home’s decor. What colors can I get this in? It comes in three finishes: Silver, Merlot or Champagne. It stands about 15 inches when sitting in its base. Is the power adapter/charger dual voltage 110/220V? UL approved for 110-120 voltage. How long does it take to open a bottle of wine? If you have already removed the foil, it takes about ten seconds. Does it work on synthetic corks? Yes. The opener can extract corks of any material. The rechargeable battery is not replaceable. The Vremi electric wine opener is the ideal accessory for entertaining as well as everyday use. Constructed of high-quality stainless steel and ABS rubber, this sturdy opener is made to last. It features a soft grip handle and a transparent shell around the opener so you can easily see when the cork has been extracted. An LED light lets you know your battery level. This opener comes with an accessory set that includes a wine pourer, foil cutter, and the charging base. Does the opener have a light? Yes, the light is red when it is charging and green once it has fully charged. This model stands about 9.4 inches in its charging base. I want to give this as a gift. Does it come in a box? Yes. It comes in a sturdy box that is suitable for gift giving. Yes. This corkscrew can extract corks of any material. The Munion electric wine opener can open 45 bottles of wine on a single charge. It is constructed of FDA certified, environmentally friendly stainless steel. It can remove a cork in eight seconds and takes only four hours to charge fully. Sturdy and sophisticated, the Munion has a 100% lifetime guarantee and a 2-year warranty. A bright blue LED light reminds you when it's time to charge the device. Will it work with one hand? Yes. The opener is easy enough to use with one hand. This model stands about 9.1 inches. The specifications for the power adapter are 100-240V, DC 4.2V, 500mA, 50/60Hz. Does this come with a charging base? There is no charging base. There is an enclosed lightning charger that plugs into a hole in the back of the unit and can be plugged into any outlet. Yes. This corkscrew can extract plastic, synthetic, or regular corks. This electric corkscrew from BFULL includes not only the wine bottle opener, but an air pump wine opener, two vacuum bottle stoppers, a wine pourer, and a foil cutter. The sleek design takes just a few seconds to open a bottle of wine. The cordless design means there are no charging docks or cords to worry about. All you need are four AA batteries to operate this opener. It comes in a nice organized gift box so you can keep all the accessories together in one spot. Lightweight and portable, this opener comes with a lifetime warranty. Yes. This charger is simple to operate with one hand. It stands about 11.2 inches on the counter. Is the power adapter charger dual voltage? There is no power adapter for this electric corkscrew. It uses four AAA batteries. What does the lifetime warranty mean? If you are not happy for any reason, you can send it back for a full refund or a replacement. Yes. It works on all types of corks. 1.65 lbs. 11.2 x 8.3 x 2.7 inches China Foil Cutter, pourer, two stoppers, and an air pressure opener. An electric opener can save you time and aggravation the next time you reach for your favorite Vino. And if you host a lot of events that require you to open multiple bottles of wine, an electric opener will likely become your new favorite kitchen appliance and save you valuable time so that you can mingle with your guests. Cheers! I would like to buy myself an electric bottle opener for wine, but I do not know which one. Was it suitable for all bottles? 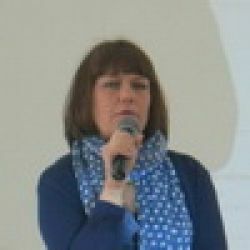 And whether it is possible for her to open champagne or other drinks with a cork. If not, is there any kind of universal electric opener?